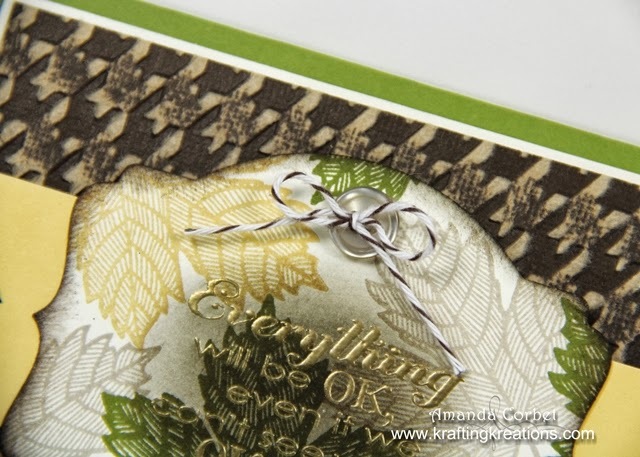 Of course I just HAD to make a fun fall card with the Magnificent Maple stamp set for the October Make and Take! So.... here it is! For this card I started off with a 5-1/2" x 8-1/2" piece of Old Olive card stock. Next I cut a 3-3/4" x 5" piece of Early Espresso Core'dinations card stock. I ran this through the Big Shot in the Houndstooth embossing folder and used the sanding block to remove the top layer from the raised texture. This was adhered onto a 3-7/8" x 5-1/8" piece of Very Vanilla card stock then adhered onto the card front. Next I cut a 3-3/4" x 4-1/2" piece of Very Vanilla card stock. I stamped the Magnificent Maple leaf onto the card stock in Crumb Cake, So Saffron, and Old Olive ink. Then I stamped the greeting from Really Good Greetings onto the card stock in Versamark ink, covered the image with Gold embossing powder, tapped off the excess, and heated with my Heat Tool. I ran this through the Big Shot with the 2nd from smallest Deco Labels Framelits and sponged some Early Espresso ink around the edges and in the center. I cut a piece of So Saffron card stock 1-1/2" x 5" and used Paper Snips to cut a dove-tail shape in each end. I adhered the label onto the So Saffron banner and adhered this onto the card front with Stampin' Dimensionals. For a little bit of fun I threaded a piece of Early Espresso Baker's Twine through a Neutrals Button and tied it into a bow. The button was adhered onto the card front with a Glue Dot. 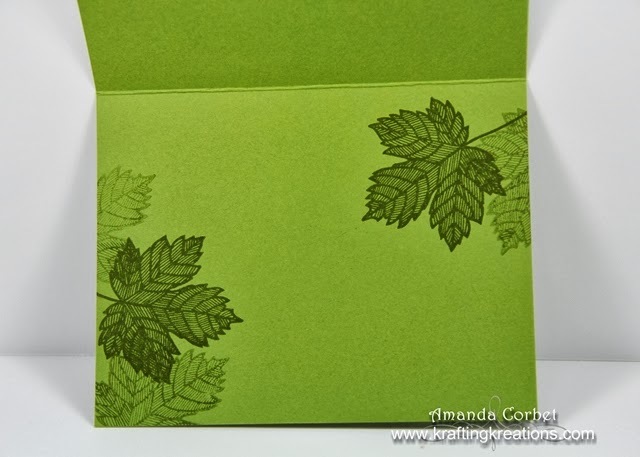 For the inside I simply stamped the leaf image several times in Old Olive ink in the upper right and bottom left corners just to add a little bit of pretty on the inside. 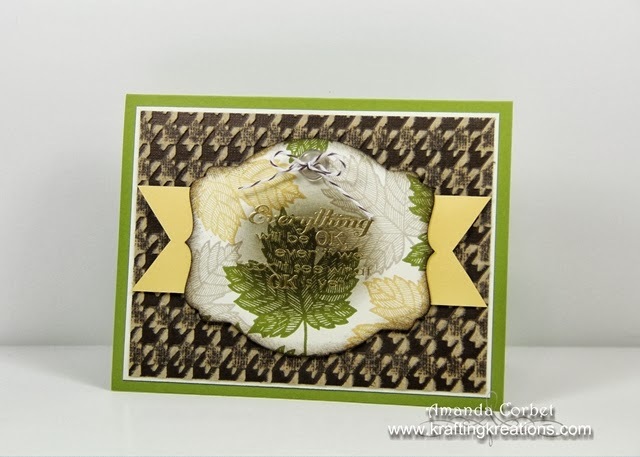 What have you been making with this fabulous leaf stamp?